This low-cost, simple-to-use monitoring solution has additional features that set it apart from the rest including a heated inlet to eliminate false reading due to humidity and the ability to be tracked on a GPS unit onsite. 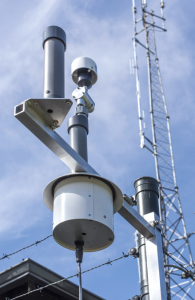 Rugged, lightweight and reliable, the Neighbourhood Monitor has all the latest technology of its counterparts to log the data to the cloud at a highly competitive price. Click here to read more about the Neighbourhood Monitor. Other PM10 monitoring instruments may have similar capabilities but this is the first US EPA approved instrument of its kind that is truly portable and rapidly deployable. No mounting and no cooling conditions needed! Very lightweight, rugged and durable, the Exactus BAM / E-BAM PLUS meets both US EPA and Australian standards for PM10 monitoring. Thanks to solar powered battery operation, with minimal set-up time and equipment needed, the Exactus BAM / E-BAM PLUS is incredibly versatile and cost-effective, yielding real-time data at short time intervals. Click here to read more about the Exactus BAM / E-BAM PLUS. 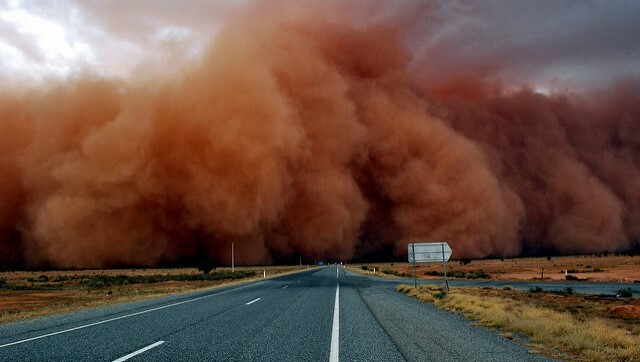 With the same feature set as the Exactus BAM, this dust solution instead monitors PM2.5 to both US EPA and Australian standards. Standalone, this self-contained unit doesn’t require temperature stabilisation making it both cost effective and efficient for ease of deployment. Click here to read more about the BAM 1022. This new particulate monitor is perfect for those seeking a lot of information about the content of dust samples. The new technology in the Fidas 200S breaks down the measurements into TSP, PM10, PM4, PM2.5 and PM1 concentration and size fractions, providing particle number information as well. Click here to read more about the Certa 1100 / Fidas 200S. Still not quite what you’re looking for? 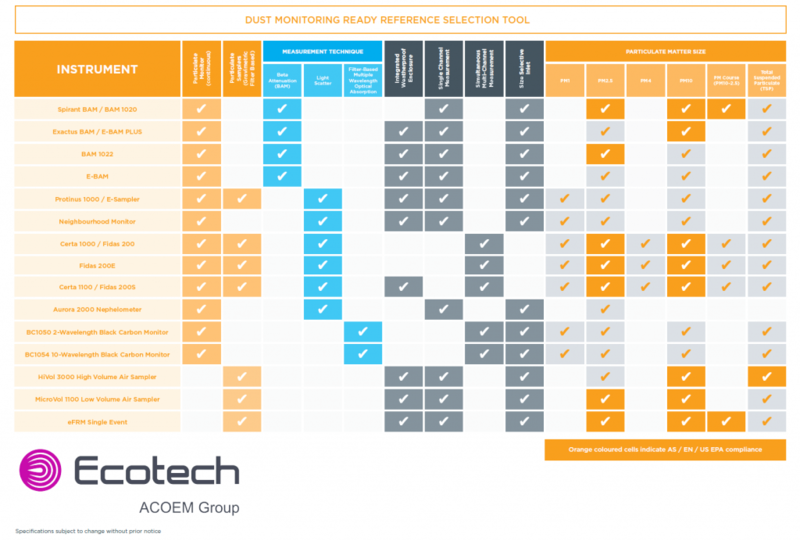 The Ready Reference Selection Tool below shows you a small selection of the more than 25 different dust monitoring and sampling devices available from Ecotech. Let Ecotech guide you through our entire range and help you find the right technical solution for you or your clients’ needs. Whether that means new equipment to meet new licensing conditions, general dust monitoring or meeting stricter compliance standards, we’re here to help you choose the right dust monitoring instrument for your project. Click here to download the Ecotech Dust Monitoring Instruments: Ready Reference Selection Tool.